Léon (The Professional) is a film that polarizes people. Some people think it is the best action film of the 90s, maybe ever; others think it is an overhyped, overdone exercise in excess. I find Léon to be a strange and singular movie that is both highly implausible and gut-wrenchingly real. Whether it becomes one of your favorite movies or leaves you wondering what all the fuss is about may depend on how real you need your movies to be. The story revolves around the relationship between a 12-year-old girl named Mathilda (Natalie Portman in her first screen role) and an Italian hitman named Léon (Jean Reno). We are shown in an impressive opening just how superb a hitman Léon is as he takes out a squad of heavily armed bodyguards for his boss Tony (Danny Aiello) to teach a maverick drug trafficker a lesson. There is no possible way that Léon could have pulled off the feat Besson shows us. What we are witnessing is a French fantasy of an American action movie, with stylized action and the American mystique of the invulnerable hero played large for the entertainment of the audience, the players, and the director. It's hard to view as a hero a man who can off a half-dozen people for money and then go home and water his plant, but this is the irony of Hollywood films that Besson is playing with. Léon lives in a New York apartment building of--what else?--weirdos. Next door to him live Mathilda, her scumbag father (Michael Badalucco), her prostitute stepmother (Ellen Green), her slutty half-sister (Elizabeth Regen), and her beloved 4-year-old brother (Carl J. Matusovich). Since Léon is a weirdo, too (has a plant for a best friend, sleeps sitting up in a chair, does power sit-ups with his feet tied to his mattress for leverage, drinks gallons of milk in a week), he is never really noticed. Mathilda's small talk with him in the hall after his superhuman hit job is a rare event in his life that establishes a connection, however tenuous, between them. Enter the fly in the ointment, Stansfield (Gary Oldman), an exceedingly live and deadly wire looking to ground itself into Mathilda's father for cutting some 100% heroin with 10% filler and hiding the 10% pure for himself. Badalucco insists he doesn't know who messed with the heroin. Although this must be a lie, Stansfield gives Badalucco until noon the next day to come clean--we sense that owning up to his deception will not change his fate, but never mind. The deadline convention is another that Besson feels must be obeyed. Shortly before noon, Mathilda goes out to buy groceries. She sees Léon and asks if he wants her to pick up some milk for him. "Two quarts, right?" I don't know how she would know this, but she does, and Léon becomes aware that he is not as invisible as he thinks he is. While she is out, Stansfield returns with a bunch of sleazy-looking guys who appear to be either as crazy or as drug-addled as he is. They storm the apartment, shooting first and asking questions of the last one standing, Badalucco. When he still won't give up the dope, they toss the apartment. Badalucco gets his hands on a rifle and tries to blast his way out. Stansfield executes him and empties an entire magazine into him because he got blood on Stansfield's suit. This massacre is played for laughs; we are not meant to sympathize with anyone in this family but Mathilda and her brother. Mathilda returns home and unaccountably passes by the open door of her blood-soaked apartment without Stansfield or his men impeding her in any way. She knocks on Léon's door and asks to be let in. He refuses for some time, but as her pleas become more urgent, he is forced to relent. 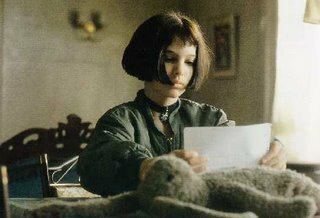 In the morning, Mathilda learns that Léon is a "cleaner," a hitman, and she begs him to teach her his trade so that she can avenge her brother's death. Eventually Léon agrees. Tony is worried about Léon when he comes to get his old, outmoded rifle "for training." He becomes more worried when Léon asks him for some of the money Tony has been "holding" for him so that he doesn't have to put it in a bank ("Banks get knocked over. Nobody knocks over Tony."). Léon has a girl, right? Nothing but trouble. Little does Tony know what kind of a girl and what kind of training Léon is involved with. Mathilda learns where Stansfield can be found--on the 46th floor of the federal Drug Enforcement Agency (DEA) building. He and his crew are crooked cops! She goes to the building to slay him, pretending to be--what else?--a pizza delivery girl. Stansfield comes close to killing her but is interrupted by one of his crew. It then becomes time for Léon to step in and do the job for her. 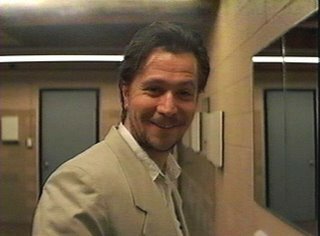 The climax of the film occurs when Stansfield requisitions the entire firepower of the New York DEA to take down Léon in a highly implausible sequence reminiscent of the flying warriors battling in Crouching Tiger, Hidden Dragon, and with just as much visual flare. The ending of the film is predictable, a bit unsatisfying, but still neat and logical. So what makes so many people cling to this film with a bursting heart? Simple. Jean Reno. The violence Léon engages in is cartoon violence against cartoon villians, so we are free to wallow in the familiar and sentimental story of a lonely outsider whose heart is warmed by a child. Reno plays Léon with such comic tenderness that our hearts can't help going out to him. He's an illiterate immigrant without options. He tenderly cares for his plant like it was his child. He becomes Tony's cut-rate hitman who gets promised $5,000 a head while being paid only a meager allowance, but he thinks Tony is taking care of him. In an odd way, he's right. Tony uses Léon, but he takes a beating for him, too. He knows Léon is a simple man who doesn't screw up or double-cross him, and he worries when Léon becomes involved with Mathilda. I can add little of meaning to this great review except that I always find Stansfield's comeuppance one of the most satisfying in the annals of bad guys' sticky ends. Mark, Welcome to my blog and thanks. You have a wonderful site yourself. I have not seen Sundays and Cybele--in fact, I have never heard of it. Relationships between children and adults (usually crusty, lonely men) are sort of a staple in Hollywood. In have a review of The Rag Man on this site that follows a similar theme. I particularly like the combination of the theme with the exuberance of a French cinephile director. I'm not sure why the French love Hollywood so, but they've used its conventions to such great effect.